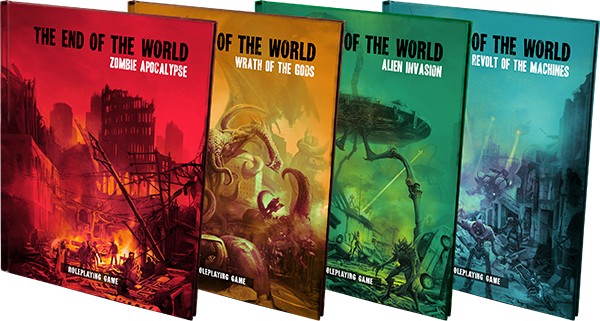 Fantasy Flight Games is taking us to The End of the World with a new roleplaying game line of horror and survival in humanity’s last days! The roleplaying game will be made up of four books. Each book offers a different apocalyptic genre and experience. As you’d expect the series kicks off with a Zombie Apocalypse. The gam challenges you to face hordes of undead that rise and stalk the earth, hungry for the flesh of the living. The second released forces you to feel with the Wrath of the Gods. Players are pitted against a pantheon of supernatural foes intent of destroying humanity. This ranges from the Mayan apocalypse to Cthulhu, the gods return to exact terrible vengeance in this book. The third installment brings an Alien Invasion. Get ready to battle unknown life forms from beyond our galaxy. You may face a species of conquering warriors, or aliens too small to see with the naked eye. After all of that destruction there’s a Revolt of the Machines. There you match wits against artificial intelligence. When our technology develops consciousness, even normal people will need to battle technology in every form. Each book is self-contained, containing the rules systems, so you can pick just one book up and you’re good to go! Also, instead of taking ont he role of some fictional character, this roleplaying game(s) throws you into the mix. That’s right, this is you dealing with the world ending. You’ll be able to pick attributes to better represent you. This also means you’ll start with what you’d actually be limited to in real life. It’s not only a game, but practice for when the real thing happens! The game hits shelves later this year.